Full-welding type direct-buried steel valve with dual seats (soft and metal seats), with high stiffness and dust resistance. Installation of welding type piping is increasing recently due to increasing demand for city gas, thus extending conducting pipes and increasing pressure. In addition, due to the existence of many other underground utilities, more and more direct-buried shut-off valves are required. Our newly developed full-welding direct-buried steel valves are high-grade products that are equipped with all the functions required for shut-off valves in gas conducting steel pipelines, contributing to the development of the city gas industry. Direct-buried and steel pipe welding type must avoid external leakage and eliminate any impact on its operation or sealing performance from ground subsidence and vibration from earthquake or above ground traffic. 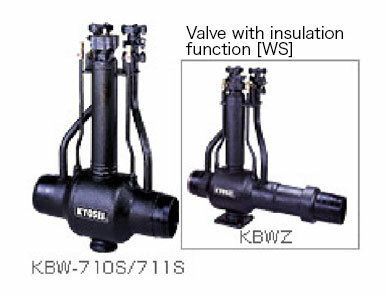 The steel valve body has an integrated welded structure made of materially stable carbon steel pipes for pressure service (STPG) or molded from a rolled steel for welded structure (SM400B), having high stiffness and reliability equivalent to or higher than that of the steel pipes to be connected. Valve sealing performance must be protected from any foreign matter such as sand, rust and weld slugs in the pipeline. This steel valve uses a quadruple sealing mechanism, which employs twin seats, a newly developed special soft seat and a metallic seat, in both upstream and downstream. In addition, its self-seal system with fluid pressure ensures stable sealing performance for low- to medium-pressure for a long period of time. Any problem at the special soft seat after prolonged use will be backed up by the metal seat, which works as emergency resuscitation equipment to allow injection of sealant, ensuring reliable sealing performance for a long period of time. 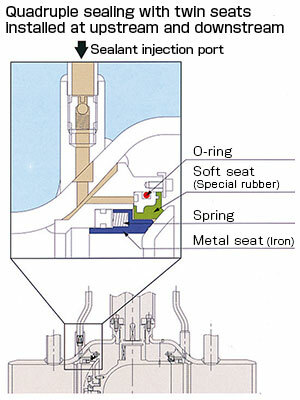 Sealing is made with the special soft seat for most of the time, so sealant injection at each opening/closing time is not required, requiring least maintenance. Special reducer can open/close valve at low torque and low rotation speed, enabling quick response in emergency. Maintenance hole size for valve operation can be selected from two sizes: standard (900 x 600) and compact (diameter: 600). The compact type maintenance hole can be installed in half the space compared with the standard size, reducing cost. 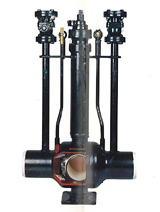 The valve outer surface is covered with a coal tar polyurethane anti-corrosion lining to prevent corrosion, insulate it from soil, and protect the valve for a long period of time.